The Argus C-4 is a very nice-handling, affordable rangefinder camera. Its construction and shutter design are quite different from the C-3, so the sketches below may come in handy if you experience shutter or rangefinder problems. The Model 21 (Markfinder) and the C-44 are very similar in construction, these sketches should help with those too. CAUTION! DO NOT remove the shutter speed dial from one of these cameras! It doesn't get you anywhere, and there is a serious risk of the shaft slipping back into the body and jamming the mechanism. 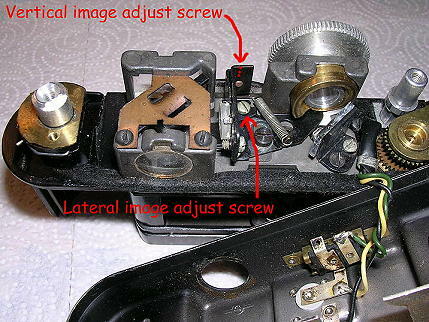 If this happens, you have to remove the entire shutter module from the camera as shown below. Here's a sketch for getting the shutter blade assembly off of the C44. The most common cause of shutter jams is oil in the shutter blades. You can disassemble the shutter from the front to reach them. Once you've gotten this far, further disassembly of the shutter blade assembly involves lots of loose parts: use the sketch below as a guide, but pay careful attention to the positions of all of the parts as you go. If you need to reach the timing escapement or other mechanisms, or the rangefinder, the top cover must come off. This sketch shows the dissasembly of the top cover and removal of the shutter module from the body (you'll need to remove the front leather before you can take the shutter out).